Jerry Bergonzi Jazz Line Volume 3 PDF + Mp3 CD download. A clear and practical step-by-step approach to chromaticism, line playing and voice leading. The CD contains 23 play-along tracks (most of them played in two tempos), based on standard chord progressions, performed by a professional rhythm section, featuring Renato Chicco on piano, Dave Santoro on bass, and Adam Nussbaum on drums. In addition Jerry demonstrates various exercises and approaches on tenor saxophone. Chord changes are included for C concert, B flat and E flat instruments. Jerry Bergonzi is a highly respected jazz educator/musician who lives and teaches in the Boston area. Over many years his “Inside Improvisation” system has proven to be tremendously successful. 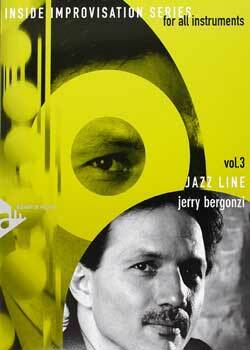 Download Jerry Bergonzi – Jazz Line Volume 3 PDF free and other books from our site. Only high quality PDF scans. Please write a review, it's important for our community.